Wind speeds on Neptune can reach 450 meters per second. Neptune was discovered because its gravitational field was affecting the orbit of Uranus. Neptune is sometimes the ninth planet from the Sun. How big is this planet ? 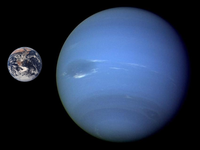 Neptune is very similar to Uranus in size. Its diameter is only slightly smaller, at 49,528 km across. It is almost as big as four Earths in a row. The atmosphere of Neptune has some dark blue spots. When the Voyager probe went by Neptune in 1989, it saw a large one called the Great Dark Spot. In 1994, it vanished, but later reappeared. There is also a large white cloud nicknamed "Scooter." It goes around Neptune every 16 hours. The winds of Neptune are very fast, blowing at up to 2000 km per hour. That is about four times faster than the fastest recorded tornado on Earth. What are its rings like? Neptune has some faint rings that are dark and hard to see. There are clumps in some parts of the rings where the material is denser. Neptune has 13 known moons. There could be more. There are five small potato-shaped moons orbiting close to Neptune. Triton is the largest moon of Neptune. Scientists think that it is a lot like Pluto. It is 2700 km across. It is made of rock and ice. It has a surface temperature of âˆ’235 Â°C Triton has a very thin atmosphere made up of nitrogen and a little methane. There are volcanoes that have eruptions of liquid nitrogen, dust, or methane compounds. The eruptions happen because of the seasons. There are few craters because the eruptions cover them up. There are ice caps that change sizes with the seasons. There are also ridges and valleys. They may have formed because of repeated freezing and thawing. An interesting thing about Triton's orbit is that it goes around Neptune in the opposite direction that Neptune's rotates. Because of this, scientists think that Triton was captured by Neptune long ago. In Roman mythology, Triton was the son of Neptune. Nereid is an irregularly shaped moon about 340 km across. Its orbit is very eccentric or noncircular. It may have been captured by Neptune or moved into the eccentric orbit by Triton's gravity when Triton got captured. In Roman mythology Nereids were sea nymphs. There are five other known moons. They are small potato-shaped moons far from Neptune. There might be more we haven't seen yet. A day on Neptune lasts 16 hour and 7 minutes. One year on Neptune is about 165 Earth years, or 60,265 days. Neptune is made of rock and metal in the core. The core is probably bigger than Uranus's because Neptune weighs more, but is the same size. Around the core is rock, water, ammonia and methane. The atmosphere is made of hydrogen and helium. Lower down in the atmosphere, there is methane and ammonia too. The methane makes Neptune look blue-green. How much would Neptune's gravity pull on me? If you were floating close to the cloud tops of Neptune, it would pull you down with a force only a little stronger than the force of Earth's gravity. The effects of Neptune's larger radius and its mass almost cancel out, making the force only a little bigger. If you weighed 100 pounds on Earth you would weigh 109.6 pounds on Neptune. 1) How long is a day on Neptune? 3) A 100 pound object would pull with how many pounds of force on the planet Neptune? 3) How long does it take Neptune to travel once around the Sun? 2. Which statement is not correct about the planet Neptune? b) the surface of Neptune is a lot like Pluto with a surface temperature of -235 degrees C.
3. What statement best describes the surface of Neptune? b) Neptune is made of rock and metal in the core. 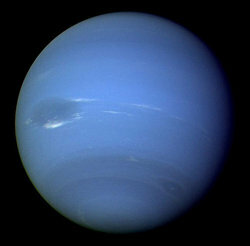 5. Who was the planet Neptune named after?